Keep your furniture and flooring protected from paint and dust. I know, it should be a prerequisite shouldn’t it? But not all painters and decorators carry out this routine part of the project. Touching on another subject, I bet that same painter didn’t even have public liability insurance. 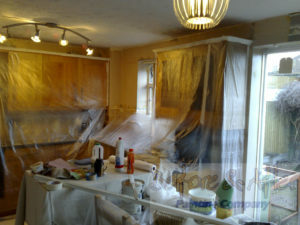 I wish home owners would take more time in finding a good painter and decorator!!! 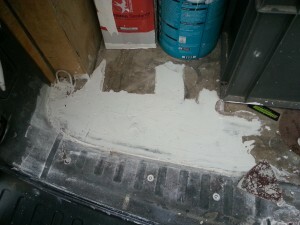 When visiting the project for the first time, I am already looking at how to go about laying down temporary floor protection and ways in protecting your furniture. First off is to remove my work shoes at the door. That goes a long way, especially with the ladies of the older generation. Each room poses its own challenges on how or where to safely place Packexe or dust sheets on the floor or protecting items such as kitchen cabinets or protecting wallpaper if the home owner only requires a ceiling painted. Protecting the carpet when painting. More often than not, the carpet will be staying in the room as the home owner may not need a new one just yet. There are one of two options here. 1/ Lift the carpet, roll up and take it out of the room until the decorating is complete. 2/ Mask up the carpet where it meets the skirting (see image to the right). This is the favourite choice of 98% of home owners I have worked with. The masking tape is tucked down between the carpet and the skirting. My Packexe is then laid or the Bolton Twill dust sheets are then moved back toward the perimeter protecting the flooring. Once the paint is dry, the tape lifts away easily and the carpet is paint free and the skirting is carpet fibre free. Protecting the furniture when decorating. Sometimes, it just isn’t possible to clear the room completely of all furniture. It’s not always the case of it can’t be moved, but more the case of where the flippin’ ‘eck are you gonna put it? Large items such as lounge display units, bedroom wardrobes and dressers can’t always be removed from the room and kitchen cabinets obviously aren’t going anywhere. As you can see by the image to your right, I protect all kitchen cabinets with poly sheeting. All sheets are secured to the cornice using masking tape. At the end of each day, if the kitchen is in use by the house holder, all the sheets can be rolled and tucked up above the units. *Only if there is no risk of fire with lighting on top of the units etc. This kitchen was for a friend in Sittingbourne. New balusters were fitted to his stairs and stained (off left of picture). I arranged for a carpenter friend to fit them. Sawdust everywhere (couldn’t be helped), but no sawdust behind my poly sheets! My friend and his wife were over the moon with the standard of the finished work. Hopefully you can see that painting and decorating is not just getting the paint tin open and slapping a bit of paint about with a brush and roller. A lot of pro painters do care about your home and its contents. I am one of those pro’s. Make sure your home is looked after by Before & After Painting! 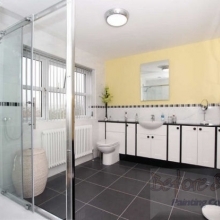 « Finding a good painter and decorator in Kent.